Dr Michael Schwarzkopf with Metal Powder Report consulting editor Ken Brookes (left) at a recent Plansee Seminar. Photo credit Plansee Group. Dr Michael Schwarzkopf, long-standing chairman of the Plansee Group executive board, has moved to the supervisory board. His former colleagues on the executive board, Bernhard Schretter and Karlheinz Wex, are now leading the Plansee Group together with immediate effect. 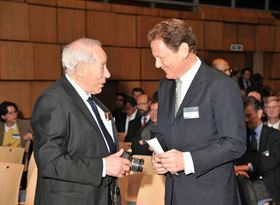 Schwarzkopf has worked for the Plansee Group for 27 years and was chairman of the executive board for 21 years. ‘After my withdrawal from day-to-day business, I will, as an active chairman of the supervisory board, focus primarily on two topics – the strategic development of the Plansee Group and the continuous development of top management,’ Schwarzkopf said.